For the 10th Ojai Chautauqua, organizers decided to do something a little different. 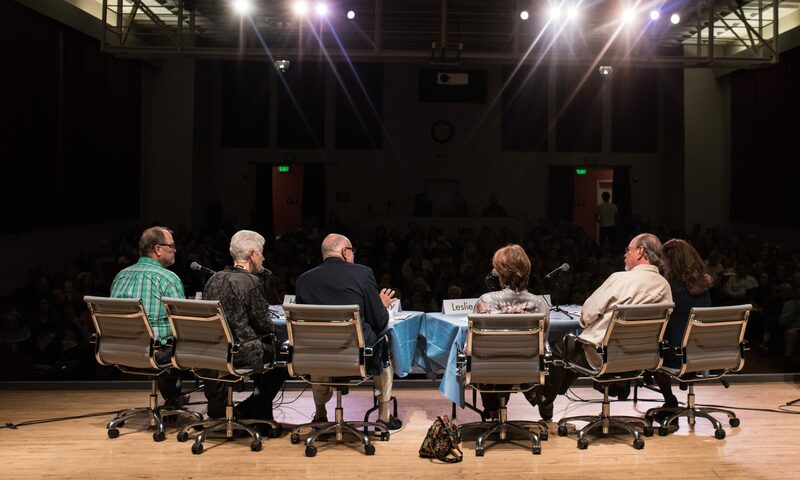 Rather than host a full panel to explore one topic, the Oct. 20 event featured just two people on stage: Dan Schnur and Warren Olney. Schnur and Olney’s wide-ranging, open-ended discussion touched on many things, but the overarching theme centered around the current political climate in America — how we got to this point, and where we go from here. The pair are uniquely qualified for such an evening. Schnur, familiar to Chautauqua fans as a moderator for several past events, is a professor at the USC Annenberg School for Communications and at the Institute of Governmental Studies at UC Berkeley. He has also consulted for numerous political campaigns, and is a regular news commentator both locally and nationally. Olney, meanwhile, brought more than 50 years of journalism experience from his time as a television, radio and print journalist. Southern California NPR listeners immediately recognized Olney’s distinctive voice from his time hosting KCRW’s To the Point and Olney in L.A. His long-running public radio programs were broadcast across the West Coast. Ever the Renaissance man, Olney is now making the transition to the new medium of Podcasting. This opened the door to what would become the theme of the evening. Politicians have become performers, Schnur and Olney agreed. They’re going for the soundbites that will be played over and over. This eventually, and inevitably, created an environment where there was more dishonesty than honesty in campaigns, Olney said. “And that paved the way for Donald Trump.” Trump is an expert in keeping the focus on himself, Olney added. Schnur and Olney then considered the ways in which the media aided Trump — whether intentionally or not. Olney brought up the example of CNN, which would broadcast Trump rallies uninterrupted for long stretches. “And CNN’s ratings went up!” he said. Hillary Clinton, the so-called policy wonk, also got roped into the game. She eventually began doing what Trump was doing — attacking, making inflammatory statements, etc. — “Because it worked!” Olney said. And Diane Feinstein is now being attacked for not attacking Trump enough, he added. Schnur added poignantly, ‘We live in our own echo chamber … compromise is defeat.” He then asked Olney, “Are we too polarized to get anything done?” Possibly, they both agreed. There are a few promising hints of bipartisanship, but they are few and far between. Gone are the days when Ronald Reagan could meet with Tip O’Neill could meet privately to negotiate; “That can’t happen in the ‘Twitterverse’ of today,” Schnur said. So what’s to be done? Again, Schnur and Olney admitted they didn’t know. “It it were easy, it would be done,” Schnur said. There’s nothing wrong with nationalism, if done properly. This brought up a new topic: confident nationalism vs. fear-based nationalism. Americans love challenges, but to be successful, the solution must not be a zero sum game. Moving forward in a way that is better for all is the right path forward. And again — easier said than done, nowadays. Shifting gears a bit, Schnur and Olney then delved into what’s coming next: midterm elections. We are, Schnur reminded the audience, just 10 weeks away from being in a midterm election year. What should we be looking for? Battles — in both parties — between the party establishment and its insurgencies. “More and more Democrats are looking to storm the gates, too,” Schnur noted. Schnur took it one step further, asking if we are being polarized more and more, or if the polarizing voices are simply getting louder? Again, neither expert could give a solid answer. So what, then, is the definition of “healthy patriotism?” Well, said Olney, it’s not being behind one’s country, right or wrong; rather it is, my country, doing as best as possible for as many as possible, for a better world. Shifting to another audience-submitted question, Schnur asked Olney, “Was Hillary Clinton not talking about the issues, or was it just not covered in the media?” Olney said, “Both.” Reporters, he went on, have become stenographers, rather than making politicians be accountable for themselves. Clinton wasn’t able to provide enough of a platform for herself to carry out her issues; she wasn’t able to open herself up to demonstrate her qualities. And with a voting population that tends to go to the ballot box with a single issue in mind, the most votes often go to those who speak the loudest. Trump figured out how to lock in the voters to follow him down any road in this manner. They’ll follow him into anti-NFL territory because they resonate with his anti-immigrant, anti-Islamic statements. Another audience-generated question turned to voter turnout; how do we get more people to vote? After some discussion, Schnur and Olney agreed that two things — convenience and motivation — are key. Key, but not easy to achieve. One way to get there may be to hold elections on weekends, when fewer people are forced to take off work to vote. Another key? Educating the public. But this is also exceedingly difficult, Schur noted, particularly in a country where civics isn’t required to be taught until high school. And even then, he added, it’s not required to be a full year class. Essentially, Schnur said, we’re telling youngsters that civics “is SO unimportant, we’re not going to bother teaching it to you for your first 10 years (of school).” Olney received cheers from the audience when suggesting media literacy be taught in elementary school. Though there was much doom-and-gloom to ponder from the conversation, Olney and Schnur both heartily agreed to something positive at the end of their discussion: Yes, it IS possible to get back to substantive discussion. It won’t be easy. But radio program’s like Olney’s — and events like the Ojai Chautauqua — hold some promise in turning us back in the right direction.